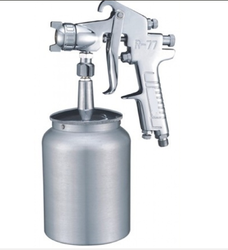 Being a client centric organization, we are able to offer Manual Spray Gun to our valued clients at market leading rates. Air Inlet (NPT): 1/4, 1/4"
We are involved in making available a quality-approved range of Spray Guns & Tools. These specially designed equipment are developed for automobile industry and are known as highly efficient means for spraying airless, HVLP and conventional coating. Our supplied range can be used for surface coating, electrostatic liquid coating and electrostatic power coating. Acknowledged amid one of the leading names, we are readily involved in the business of presenting a world class WD-40 Automotive Spray. Specially designed and developed for automobile industry, our range of Spray Gun are highly efficient means providing airless, and conventional coating for the process of. Number of guns can be decreased or increased as per the coating requirements of the client.